A Cerner Implementation marks a transitionary time for your organization. You are making a huge IT investment that should lead to both time and money saved, as well as improved care for your patients. In order to reap these rewards, however, it is vital that your Cerner Training project incorporate real-life simulations, the proper equipment and hardware, and productive classroom time for your end users. 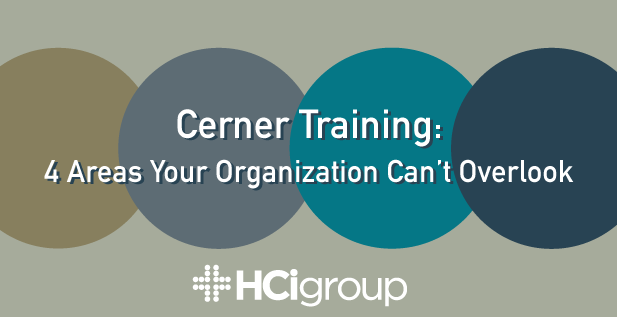 David Bell, currently a Project Coordinator for the HCI Group, spent over two years as a consultant for Cerner Corp, where he learned the most important aspects of an effective Cerner Training program. Today, he shares four areas that your organization cannot afford to overlook. When it comes to a training environment, your entire staff, from nurses to physicians, needs to be using equipment that mimics the equipment they will be using in their actual, day-to-day production environment. Desktop size is a good example of this. The size of the desktop that is used on the floor should be exactly the same size as the desktop used in training, in order to avoid confusion. If a larger desktop is used in the training room, your nurse or physician may not be expecting to have to scroll to see certain information, or may even be mixed up by the text looking smaller or scrunched. By using equipment during training that is the same size as what will be on the floor, your staff will know exactly what to expect, and you can avoid these instances of misunderstanding. Secondly, a Cerner Training project must have educated trainers who are able to provide real-life patient scenarios. For example, if a patient comes in for a testosterone shot and they brought their own testosterone, you should charge them for the administration, but not the medication. Additionally, it is critical during training to be able to relate workflow to caregiving functionality. Real-life scenarios are important in that they force your staff to think in the same way that they would on the floor. Real-life scenarios play a large role in this third aspect of Training—clinicians need to be educated on both functionality and workflow and how they go hand-in-hand. Teaching functionality (where to click whenever you want to accomplish a specific task within the system) is very important, but must be relatable to a specific workflow. A good practice is asking the clinician about things that they see on a daily basis when they are dealing with patients. After they give you an example, you can relate that material in a workflow manner. Once again, you are providing the opportunity for the clinicians to train in a way that directly pertains to how they will be using the new system on the floor. The fourth point is purely IT-related. While it may sound like an obvious point to make, it is important to make sure that all of the training equipment has been tested. Without properly functioning equipment, whether it be keyboards, desktops, etc., end users can’t be expected to properly learn from the trainers. Another big thing is making sure that all of your clinicians in the training room are physically able to see what is appearing on the screen in the training room. Is it readable? Can a person who is sitting in a large room see the screen from the back of the room? These are all things that, while they may seem insignificant, can lead to major headaches during your training project if you don’t pay due diligence. Making sure that you don’t overlook these key areas during your Training project can go a long way in helping your end users be fully prepared for when the system has gone live. The better prepared that they are for your eventual Cerner Go-Live, the better they will be at providing quality care for your patients. Have additional tips? Please let us know by commenting below. For more information on Cerner Training, please click here.